Fallen Leaf Lake is just south of Lake Tahoe. Scientists found important climate clues hidden away under Fallen Leaf Lake, just south of Lake Tahoe. 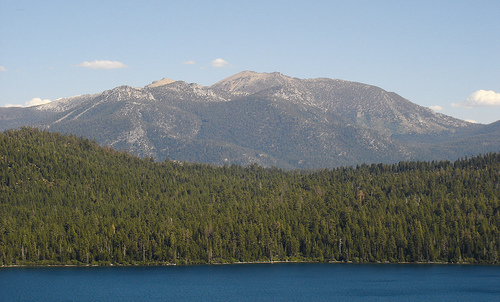 Graham Kent wasn’t researching megadroughts when he and a team of scientists began studying Fallen Leaf Lake, just south of Lake Tahoe. They were mapping faults. The little lake is a good place to study West Tahoe Fault, which cuts right through it. They wanted to confirm that the trees had really grown where they were standing, at the bottom of the lake, rather than grown somewhere else, and slid down at some point. Kent’s team discovered that the trees had grown where the shoreline of Fallen Leaf Lake once was. Clumps of trees of different ages — going back more than a thousand years — showed where the shoreline had been and how it had changed. Nice reminder that California’s climate is not necessarily long-term stable. Dr. Scott Stine of CSU East Bay found this same drought in tree stumps at Mono Lake, Walker River, and other locations along the Sierra.